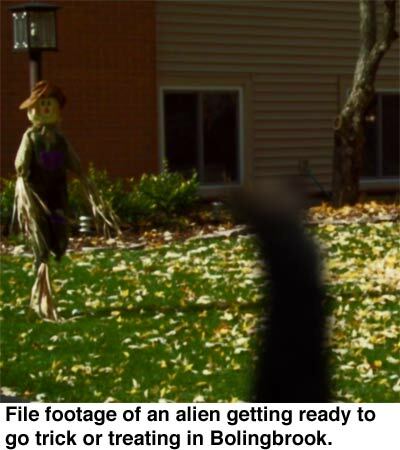 For the first time since 1988, space aliens have been barred from trick or treating in Bolingbrook. Plojakwil, a resident of Kepler-62f, said she was disappointed in the ruling. it’s not hard, but remember to keep an eye out for the trick questions. OOC Note: My issue is with Joshie Berger, not any form of Judaism. Worst Cooks in America winner Joshie Berger refused to address assault allegations made by an ex-girlfriend as he opened a new restaurant at Bolingbrook’s Clow UFO Base. DJ Grothe, former president of the James Randi Educational Foundation, and co-owner of Worst to First, sort of talked about the assault allegations against Berger. During the opening day, the dishes received mixed reviews from the patrons. While the opening night was busy, there was an incident when a human couple entered the restaurant. Each one was wearing a faceplate. Berger ran into the lobby and confronted them. Berger: You’re wearing face guards because you think I’m going to hit you, aren’t you? Do you believe everything on the Internet? Berger: Shalom Shabbat? It’s “Shabbat Shalom”. You’re (expletive deleted) Space Jews! Woman: We prefer to think of ourselves as members of the Interstellar Tribes of Israel. Berger: Well I prefer to think of you as Space Jews, and this is my place. See the sign? It says “No Political Correctness Allowed.” So you’re Space Jews! Woman: Maybe we should go elsewhere? Berger: Not yet. You have to tell me why you’re wearing those things on your faces. Man: We are observing Parach today. Woman: Yes. Centuries ago on Jaffa 4, all the plants suddenly experienced explosive growth. The colony of David was covered under miles of branches and vines. The inhabitants were down to a single tank of air. So the survivors put on their respirators and prayed. The tank only had enough air for one hour. Man: But a miracle occurred. You know who spared the people of David, and the tank supplied seven days of air. That was long enough for a rescue party to cut their way into the colony. Woman: So every time this year we wear replica respirators to remind ourselves that you know who is merciful as well as vengeful. We might stay if you serve Jaffa kosher food. Berger: There’s no Kosher food of any kind served here, and what’s with all this “you know who” shtumpik? How can you be a Space Jew and believe in God? Man: How could we see the marvels of the universe and not believe in you know who. It is disrespectful to say His name. Berger: God! God! God! God! Man: You’re a schmuck, and we’re leaving. Mayor Claar orders blast shelter for Village Hall. We want to remind our readers that Dr. Richard Carrier is suing Freethought Blogs, The Orbit, Skepticon, and several individuals for the reporting of allegations of inappropriate behavior. There is a GoFundMe page to raise funds for the defendants. Dr. Richard Carrier is suing us for reporting on his well-known allegations of misconduct. These allegations were widely reported on throughout the community, including by third-parties both critical and sympathetic to him who are not themselves defendants. This lawsuit has all the hallmarks of a SLAPP suit — a lawsuit filed to stifle legitimate criticism and commentary. The named defendants are Skepticon, The Orbit, and Freethought Blogs – as well as individuals Lauren Lane, the lead organizer of Skepticon; Stephanie Zvan, a blogger for The Orbit; PZ Myers, a blogger for Freethought Blogs; and Amy Frank-Skiba, who publicly posted her first-hand allegations against Carrier. We need your help to keep our voices alive. All the defendants are represented by the same attorney, First Amendment lawyer Marc Randazza. Randazza is providing his services at a significant discount, but we are not asking him to work for free. Plus, there are thousands of dollars in “costs” for the case that don’t include legal bills, and there is no way to discount those. In order to continue fighting this lawsuit, we, the defendants of this case, have put together this campaign to raise money to defray our costs, some of which is outstanding. Donations will be used only for this case, withdrawn by Stephanie Zvan and disbursed to the lawyers and defendants to cover costs as they’re accrued. In the event that the funds raised exceed our legal bills, they will be donated to Planned Parenthood and a breakdown of what was spent where will be performed at the close of this campaign. We are pooling our defense costs with Skepticon, however as a 501(c)3 non-profit, Skepticon is also conducting its own fundraiser where donations may be tax-deductible (ask your tax advisor). Skepticon cannot use donations it receives to help pay the shares of other individuals or organizations, though, and any excess funds raised via their campaign will go to the Skepticon conference fund. We are confident that the court will uphold our First Amendment rights. But, through time, stress, and of course financial expense, every case like this has a chilling effect. Your support enables us to fight, and creates a warmer environment – not just for us but for others in the future. Thank you for your support of freedom of speech, and may your new year be powerful and effective! These cases are expensive, even if they are dismissed. While this happened before we joined Freethought Blogs, we fully support all the defendants and hope you will consider supporting them too. With Mayor Roger Claar on a business trip and Deputy Mayor Leroy Brown on medical leave, the remaining five trustees managed Clow UFO Base for a week. Trustee Deresa Hoogland gave a presentation to the Interstellar Association of Child Carrying Beings. At first, she talked about upcoming events for Heart Haven Outreach, then stopped. No one in the audience replied. Trustee Rick Morales held a meeting with Bolingbrook’s resident space aliens. They asked if they could perform “Bad, Bad, Leroy Brown” in honor of Deputy Mayor Brown. After a minute of pointing weapons at each other, Zizgot agreed not to sing the song, and Morales said that members of the GisBlot Empire were honorary Bolingbrook residents. Trustee Maria A. Zarate managed Clow’s customs offices. She said she enjoyed the experience and was proud to deny access to a group aliens with ties to the interstellar anti-vaccination movement. The being touched itself for a few seconds and looked at its reflection in the window. Sources say Claar returned to Bolingbrook near the end of the week and praised the work of “some” of his trustees. Get well soon, Deputy Mayor Leroy Brown! Did the Bolingbrook Board of Trustees approve spending $2 million on an “Illuminati membership enhancement” during their September 26 meeting? Sources say yes. Sources say the bill, which was disguised as bills for the Pathways Parade and the Bolingbrook Golf Club, was actually to enhance the Village’s membership in the Illuminati. According to one source, the enhancement frees the village from the obligation to build coded monuments to the Illuminati or to require new road construction for Illuminati symbols. During the meeting, Trustee Robert Jaskiewicz, who is affiliated with the New World Order, asked why the bills weren’t given to the trustees in advance or posted on the website. After being told that he could have gone to the village Attorney’s office for copies of the bills, Jaskiewicz voted no. He said he could not vote to pay any bills without reviewing the details, and noted that the Village Attorney said payment could wait until the next board meeting. His no vote ended a 10-year streak without a no vote on the board. 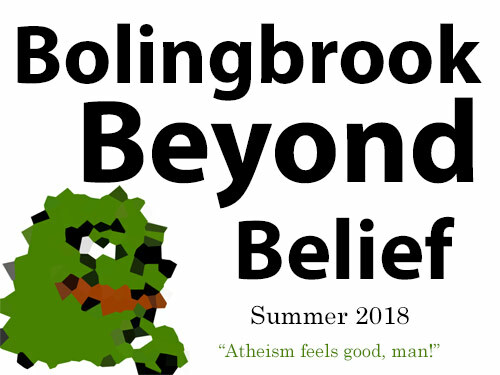 A proposed poster for the Bolingbrook Beyond Belief atheist convention. The Bolingbrook Pepe the Frog Fan Club, a self-described “Alt-right group,” announced that they are organizing an atheist convention for the summer of 2018. The convention, tentatively titled “Bolingbrook Beyond Belief” is inspired by the controversial Mythinformation Conference. Like Mythicon, “Bolingbrook Beyond Belief” plans to feature predominately “Alt-right” speakers and have liberal “special guests” in the audience. Alex pretended to gag when Skepticon was mentioned. Dennis conceded that while many YouTube personalities have asked to speak at the convention, prominent atheist leaders have not agreed to speak at Bolingbrook Beyond Belief. Back to regular posting tomorrow.